In two parts I will present an overview of the Chinese gold market for calendar year 2015. In this part we’ll focus on Shanghai Gold Exchange trading volumes. In the next post we’ll focus on physical supply and demand flows in Chinese gold market in 2015. 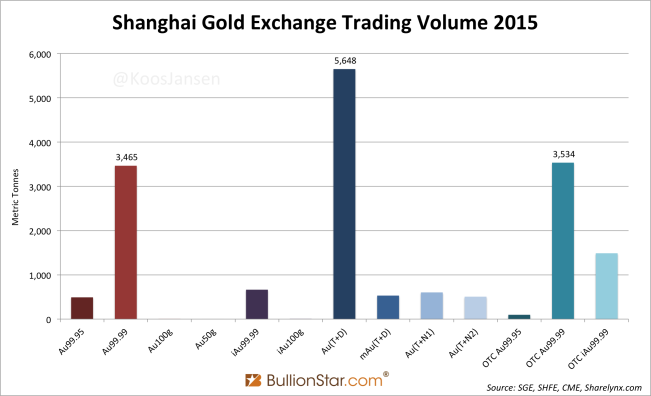 First, let us quickly assess the core volume data of the largest precious metals exchanges in China and the US. 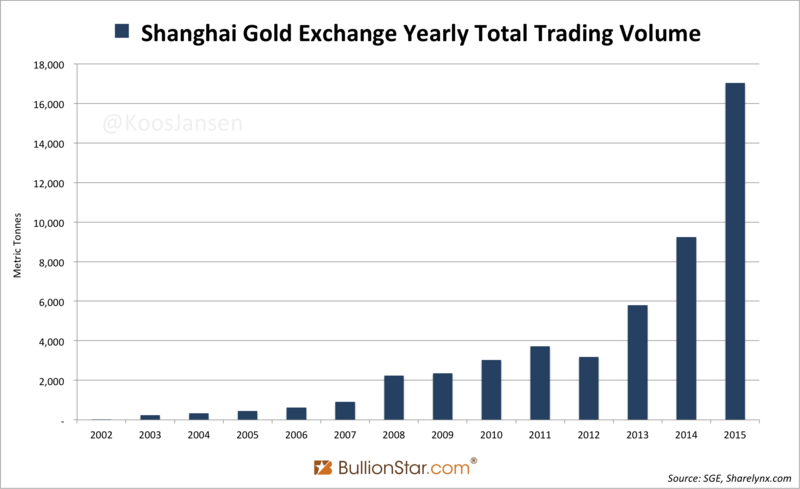 Physical and derivative gold trading at the Shanghai Gold Exchange (SGE) in 2015 reached 17,033 tonnes, up by 84 % from 9,243 tonnes in 2014. Gold futures trading at the Shanghai Futures Exchange (SHFE) in 2015 accounted for 25,421 tonnes, up 7 % from 23,750 tonnes in 2014. Consequently, total wholesale trading volume in China (SGE + SHFE) was 42,454 in 2015, up 29 % year on year. 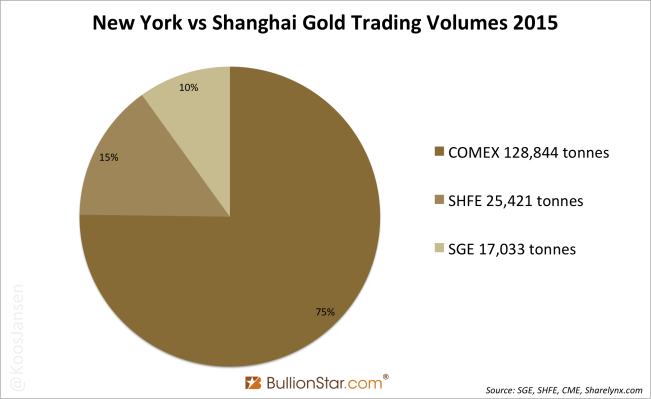 In New York at the COMEX total gold futures volume reached 128,844 tonnes for the year 2015, up 3 % from a year earlier. COMEX trading volume was three times as large as the total volume in China. It’s unknown how much gold is traded in the Over-The-Counter London Bullion Market. However, a survey conducted by the LBMA in 2011 pointed out approximately 680,783 tonnes of gold per year change hands through the London based market. All tonnages mentioned in this post are counted single-sided. There are a few more interesting data points to be found in SGE trading for 2015 when examining the developments of the specific contracts. The contracts above cannot be traded on margin and are settled (/delivered inside SGE(I) designated vaults) immediately (T+0), therefor they embody pure physical trading. Because the deferred contracts are traded on margin and there is no fixed delivery date, these derivative products embody paper trading. All SGE contracts can be traded competitively over the Exchange, but the physical contracts can also be negotiated bilaterally in the Over-The-Counter (OTC) market and then settled through the SGE system. 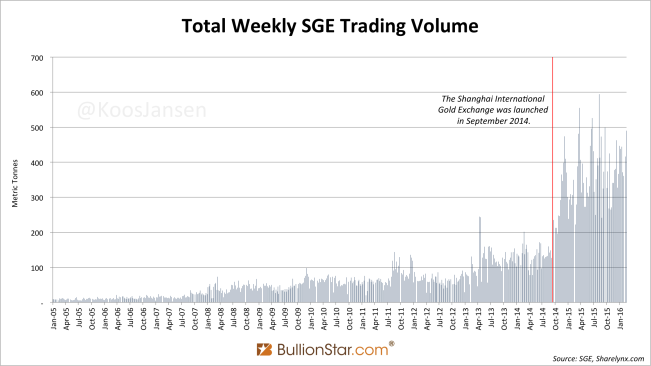 The SGE publishes the volume of these OTC trades. The most traded contract on the Exchange in 2015 was the deferred product Au(T+D). In total Au(T+D) volume accounted for 5,648 tonnes, up 30 % from the previous year. The second most traded contract was the physical product Au99.99, of which 3,465 tonnes changed hands, up 65 % from 2014 – although, if we include OTC trading total Au99.99 volume for 2015 reached 6,998 tonnes, which would make it the number one contract. The contracts Au99.5 and iA99.5 are not included in the chart, as the products have not been traded. This underlines the PBOC, that would prefer to buy 12.5 Kg bars, is not buying gold through the SGE. Physical trading (including OTC activity) at the SGE in 2015 accounted for 9,745 tonnes (57%), versus 7,288 tonnes in paper trading (43 %). The growth in total gold trading at the SGE in 2015 was the strongest since the financial crisis erupted in 2008. According to my analysis one reason for this has been the opening of the Shanghai International Gold Exchange (SGEI) in September 2014. The SGE system services gold trading for the domestic Chinese gold market. This gold traded over the SGE system is prohibited from being exported. The SGEI is a subsidiary of the SGE located in the Shanghai Free Trade Zone, where international members of the Exchange can import, trade and export gold. 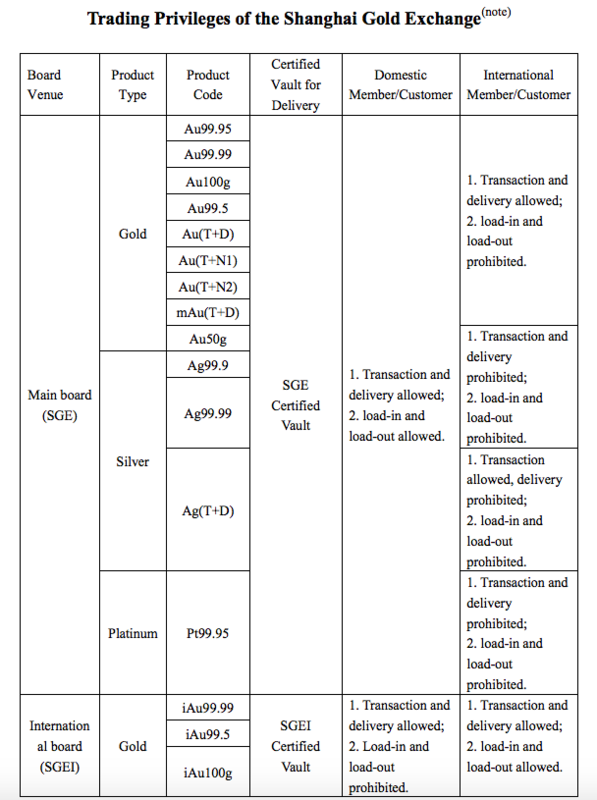 In terms of physical gold flows the SGE and SGEI are separated venues. For more information please read my previous post, “Workings Of The Shanghai International Gold Exchange”. On the surface it looks as if the SGEI has been a failure. The most traded contract at the International Board is iAu99.99. At the start of 2015 iAu99.99 trading was weak and after a short peak in April, volume came down to practically nil throughout the middle and the end of the year. Hence, most analysts stated the SGEI was dead. There are two important points that undermine this statement. The first point is that iAu99.99 can be traded in the OTC market. 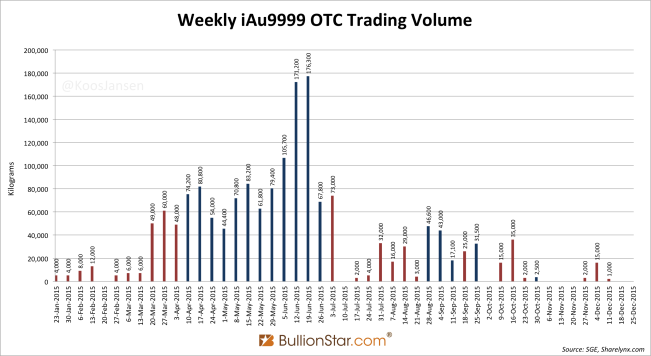 When it appeared that trading of iAu99.99 was dying out at the Exchange, in the OTC market activity continued. There is no constant trading in iAu99.99 in the OTC market, but the volumes are significantly higher than iAu99.99 trading over the Exchange (see the chart below). Tellingly, the iAu99.99 trades in the OTC market are all performed in giant batches of 100 or 1000 Kg. Have a look at the data labels in the chart below. We can see that all weekly OTC iAu99.99 volumes are in sizes one hundred (blue bars) or one thousand (red bars) 1 Kg bars. For example, look at the week that ended 3 July 2015, when exactly 73,000 Kg’s were traded. In theory 20,855 Kg’s were traded on Monday and 52,145 Kg’s on Thursday, aggregating to 73,000 Kg’s in total for the week. Though, this coincidence cannot have occurred each and every week. More likely the iAu99.99 traders in the OTC market always buy and sell per 100 or 1000 Kg’s. No other SGE or SGEI contract shows this bulky trading pattern. The second point is that international members of the Exchange are not only allowed to trade the contracts on the International Board, they’re also allowed to trade the domestic contracts, they’re just not allowed to withdraw the metal from domestic vaults. The international members that focus on arbitraging any price differentials between the US and China will prefer the most liquid contracts on the Exchange. So, for this purpose the international members would trade Au99.99 and Au(T+D). Sources at the SGE confirmed to me that indeed international members are trading Main Board contracts. 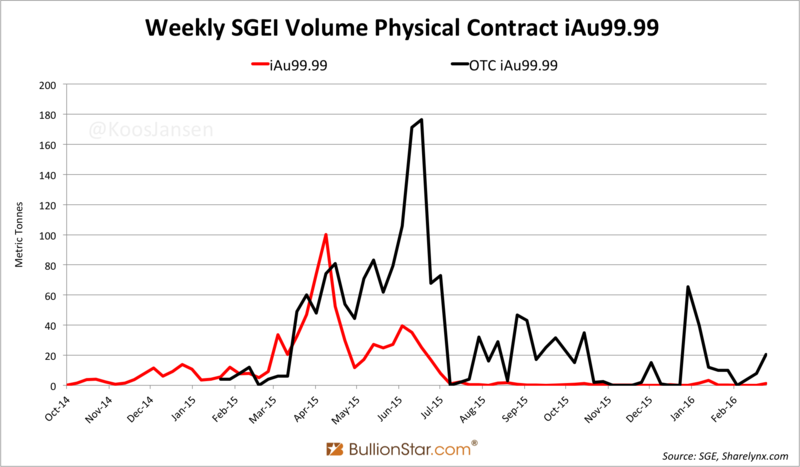 If we look at the next chart, we can see that since the inception of the SGEI in September 2014 total SGE volume (including domestic, international, physical and deferred contracts) increased significantly. My conclusion is that the gateway of the SGEI has increased liquidity at the Exchange in Shanghai and enhanced the connection between the Chinese and Western gold markets. I realize the system of the SGE and SGEI, how trading and physical gold flows are divided, is not easy to understand. The best I can do to clarify this is to present the diagram furnished by the SGE showing how trading in all contracts by all customers is organized (see below). In the next post we’ll examine the physical gold flows going through China and the Shanghai Free Trade Zone. Note, domestic members/customers are allowed to use onshore renminbi to trade all products on the Main Board, but are also allowed to use onshore renminbi to trade all products on the International Board (although load-in and load-out metal from the vaults is prohibited). In turn, international members are allowed to use offshore renminbi to trade all contracts on the International Board, but are also allowed to use offshore renminbi to trade most contracts on the Main Board (although load-in and load-out metal from the vaults is prohibited). China Continues To Drain Global Gold Inventory SGE Withdrawals 29 MT In Week 16, YTD 635 MT Shanghai Gold Exchange Physical Delivery 1750 tons YTD Debunking GFMS’ Gold Demand Statistics China Gold Import Jan-Sep 797t. Who’s Supplying? SGE Withdrawals Equal Chinese Gold Demand, Part 3 Why Austria Is Repatriating Gold From London How The World Is Being Fooled About Chinese Gold Demand Dutch Central Bank Tight-lipped About Gold Policy China’s Secret Gold Supplier Is Singapore Second Thoughts On US Official Gold Reserves Audits Audits Of US Monetary Gold Severely Lack Credibility Unprecedented Total Chinese Gold Demand 2013 Hong Kong – China gold trade yearly How Much Gold Is China Importing And Does It Still Correlates to SGE Withdrawals?